When it comes to looking good and stylish, hair styling is among the most important things that people need to do. Women tend to endeavor to attain a hairstyle that would complement their attire. They manage to acquire different looks by sporting different hairstyles. With the right hairstyle, you can ensure that you are at the top of your style game. While using anything to style your hair, there are a couple of things that you need to look for. For one thing, it is important to ensure that the product you use would not incur any damage to your hair. Your hair is liable to damage if not treated carefully, so caution is required. It is quite common for women to curl or straighten their hair to get a different look. To do this, a hair straightener is usually required. However, one needs to ensure that the hair straightener they use is of high quality and would not damage their hair. For this purpose, adequate research needs to be done so that you do not end up burning your hair by using substandard stuff. There are plenty of options available on the market. Among these is the Gurin Ceramic Tourmaline flat iron. We are going to take a look at some of the features that this hair straightener has to give you an insight into whether this is the product that would suit your requirements or you need to look at some other options. We are going to take a look at some of its features and specifications. This will ensure that you are well aware of what you are signing up for before you purchase this product. Usually, there are hair products and equipment which are suitable for only a certain hair type and as a result, the whole family cannot use it with ease. For instance, if you have frizzy and dry hair while your sister has curly hair, there are some products that both of you would not be able to use. However, this is not an issue that you would have to face with this hair straightener. It can be used for straightening, flipping, and curling all types of hair. It is provided with the feature of adjustable temperature, and the range it covers makes it suitable for all hair types. 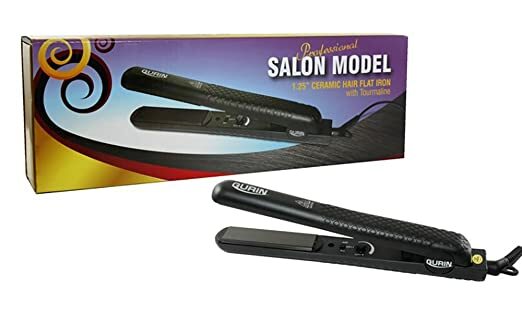 Hence, this single flat iron can be used by the whole family, making it an economical option. Furthermore, the effectiveness that it has to offer would not let you down. It can transform dull hair into straight and sleek hair with perfection. It also has a width that ensures that it can be used for any hair length and type. You can even use it to straighten your bangs. As a result, with this hair straightener, versatility is something that you stand to gain. Usually, straightening takes up a lot of time, so you need to start with it a long time before you are required to be ready. This makes it difficult to perform the task in the morning as you do not have sufficient time on your hands. This is another issue which has been dealt with in this product. It is equipped with ceramic plates that are capable of providing you with a shiny finish without the task taking a lot of time. Therefore, you would not have to be worried about spending hours with the straightener. If you adjust the temperature right, the task would be completed sooner than you had expected. It is not easy to find a straightener which would be suitable for all hair types. This is one feature of this product which will leave you impressed. The whole family can use it to style their hair with perfection. It can also be used for the hard-to-style bangs, which is another feature in its arsenal. Hence, it is clear that this product has a lot to offer. It maintains a high standard of quality, so you would not have to worry about it incurring damage within a short span. You can be confident that it can be used for a long time to come and hair styling would become a whole lot feasible with this product. Furthermore, it does not take long to heat up. Merely a couple of minutes would be required for the purpose. It also straightens the hair quickly, so you would be able to use it in the mornings without having to worry about running late for work. People who have used the straightener have showered it with praises. According to them, it is a highly valuable tool that allows them to style their hair like they want with ease. You would not have to worry about your hair being damaged if this is the straightener that you use. You will have no complaints with this straightener. Attention to detail has been paid in its manufacture, so you can be certain that you would not regret your purchase. This is the kind of hair straightener that would offer you the results that you have been looking for. It comes with a carrying case, so if you have to carry it with you, you would not have to face any problems. All in all, this is certainly an option worth considering.